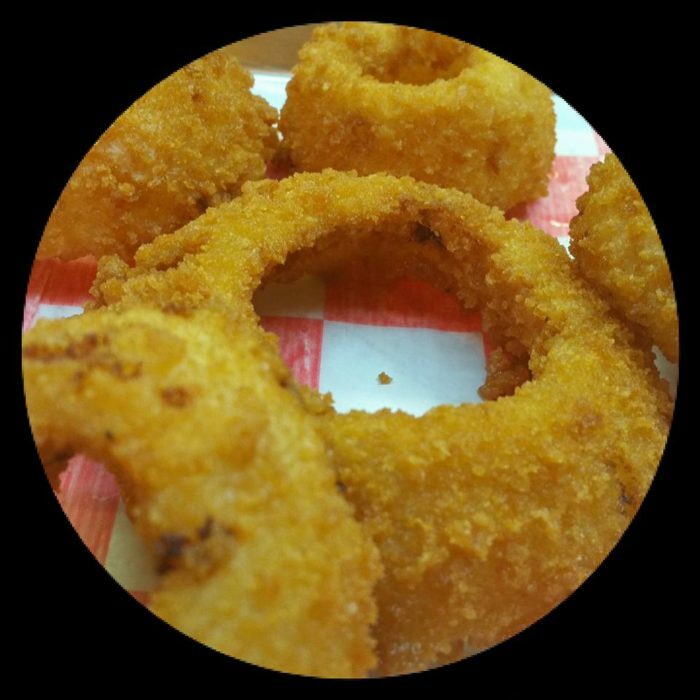 Our menu consists of various old time favorites. We combine old and new school items with a southern taste to please anyone’s taste buds. 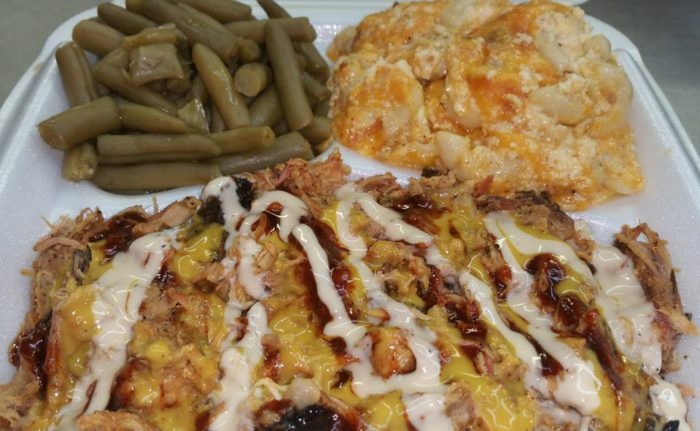 We aren’t just BBQ, we are actually a Southern Comfort Diner! In order to place an order and/or see updated prices, please click on the order online tab. Our Smoked Chicken pieces are available by the piece. 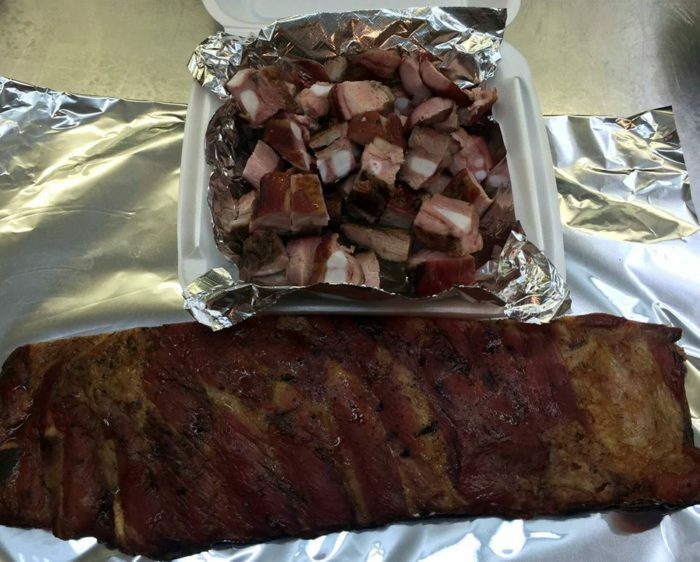 Special note: All of our bar-b-que meats are smoked. 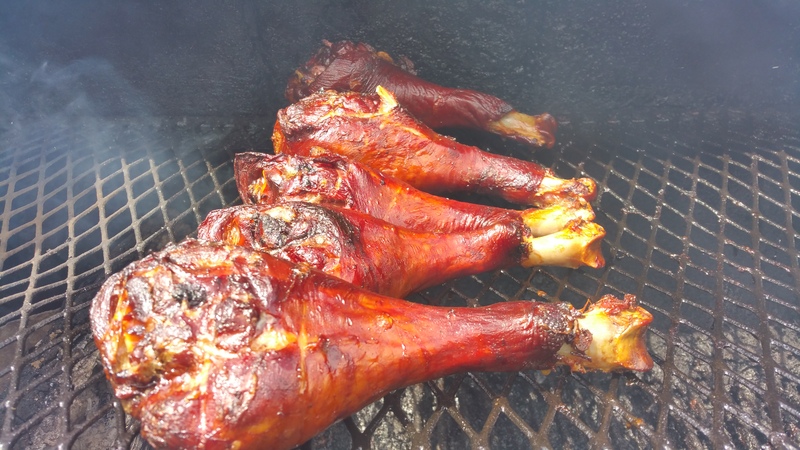 You may notice a red or pink meat color. This is normal in smoked meats. It is a product of a chemical reaction between smoke nitrates and meat protein. Made fresh to order, topped with a special blend of seasonings. 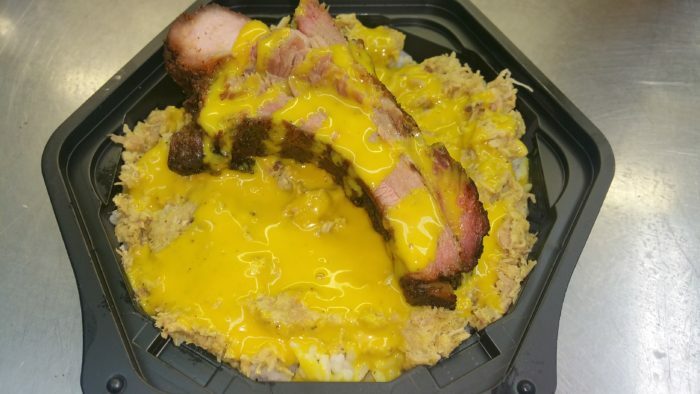 Try our hash and rice today. Big Bull’s hash is made from some of the leanest cuts of chicken. Therefore, you don’t have to concern yourself with a stomach full of grease or a headache, after you finish eating The Best Hash and Rice in Town. Choose from Bull’s 7 Signature Sauces to compliment your Hash & Rice. Signature Sauces on the side or in addition to the sauce you add to your sandwich, bowl, spud, wings, slab of ribs, pounds of meat or platter, are an additional charge. Big Bull has created 7 Signature Sauces to compliment your meal. Fried to perfection! Crispy outside and moist inside. Try one today. Sometimes, you don’t want a complete meal. 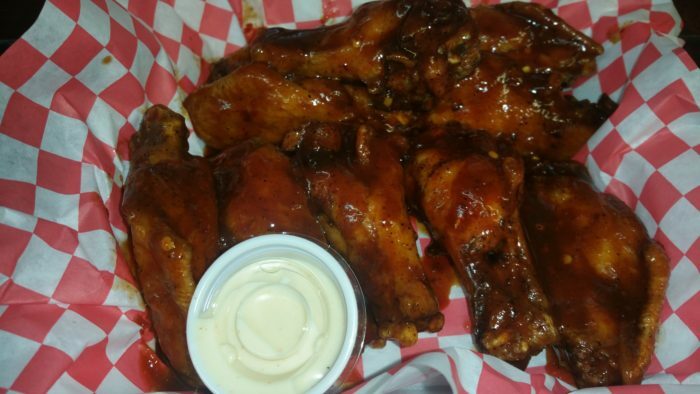 You are more than welcome to order just one baked turkey wing! Like fair food year around? Here’s your chance, for a cheaper price! REAL WOOD SMOKED! Five extra large onion rings fried crispy. Yes, you read it correctly! We are now serving Duck Wings. Four crispy Duck drums, fried to perfection and drizzled with a spicy honey sauce! Yes, you read it correctly! We are now serving Hog Wings. 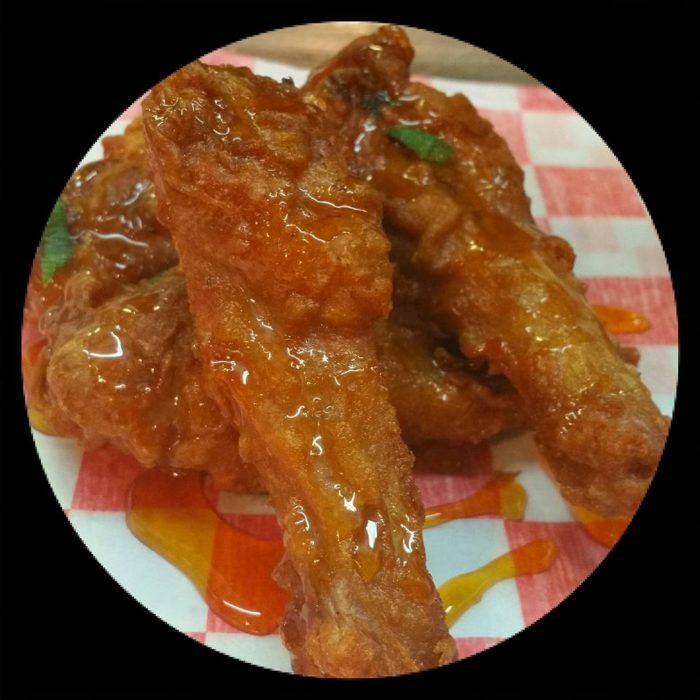 Five crispy Hog wings, fried to perfection and drizzled with a spicy honey sauce! 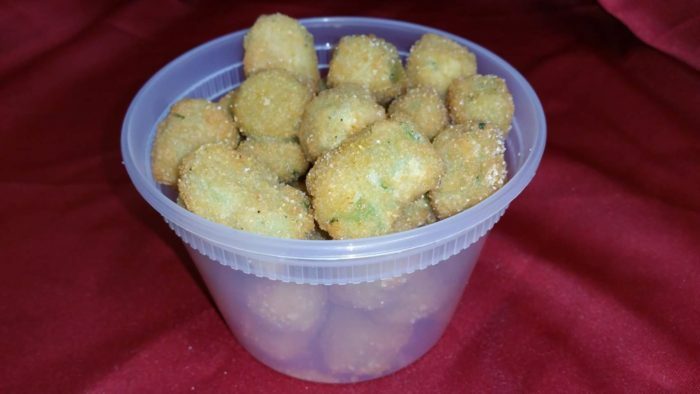 Sweet corn fried into nuggets…no words! 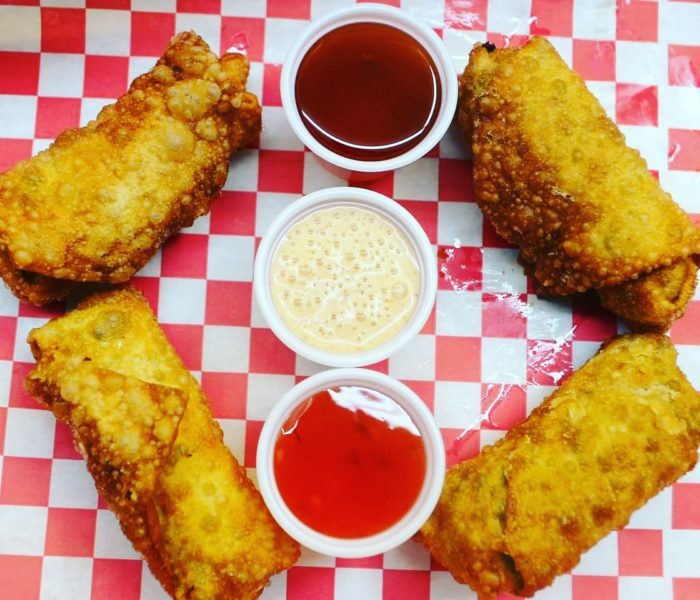 If you like Collard Greens & Smoked Chicken, you will love Mama Bull’s Egg Rolls! Nice and crunchy on the outside while moist on the inside. Try some today! Have you ever tasted heaven on a plate? Order a Loaded Pulled Chicken Fry! 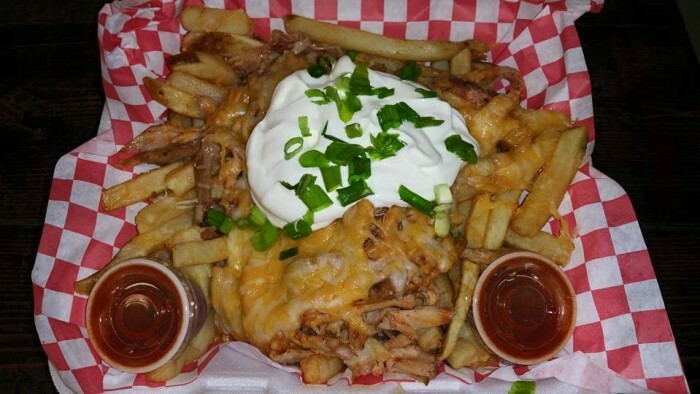 Pulled chicken on a bed of fries, covered with melted cheese, sour cream, chives, Bull’s White Sauce and your choice of an additional sauce. Do you love meat? You will love our three meat combo! Choose three of our smoked meats: Beef Brisket (2pieces), Smoked Chicken (2pieces) Pulled Pork, Pulled Chicken or Chicken Hash & Rice. Now two homemade sides, a roll or cornbread and a signature sauce. Do you love meat? You will love our two meat combo! Choose two of our smoked meats: Beef Brisket (2pieces), Smoked Chicken (2pieces) Pulled Pork, Pulled Chicken or Chicken Hash & Rice. Now two homemade sides, a roll or cornbread and a signature sauce. Do you like a little spice in your life? That’s what you will get with Bang, Bang Chicken! These are 5 cuts wings, fried to perfection. We have a special blend of spices to tickle your palate. Then we top it off with our signature Sweet Golden Honey and Bull’s White Sauces! Yummy!!! If you really want to be big and bad, get the Bang, Bang, BANG Chicken! The third bang is from our 7 Seconds Sauce (starts sweet and ends spicy). Go big or go home! *picture is shown with fries. *Our sides aren’t cooked with pork! 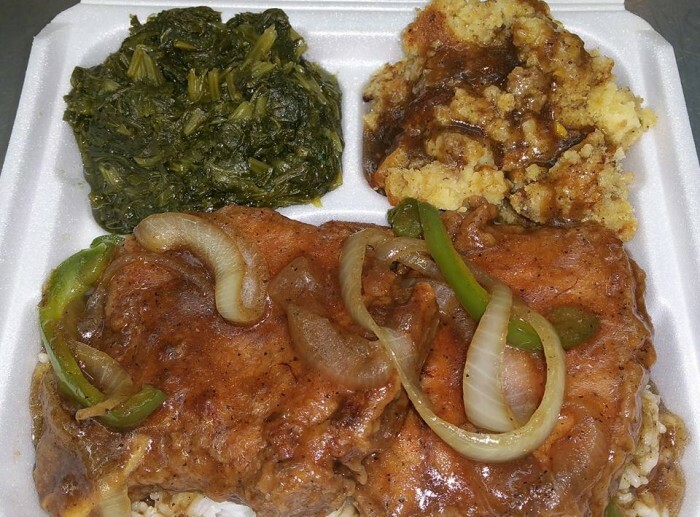 2 Smothered or Fried Pork Chops over rice and gravy with your choice of two sides, roll/corn bread. Be adventurous and have one fried and one smothered on the same platter. The best of both worlds. *Our sides aren’t made with pork! 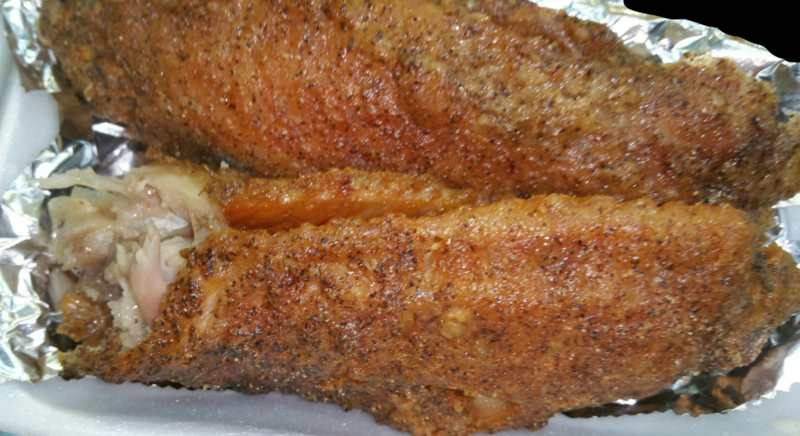 2 Tender and Moist Baked or Fried Turkey Wings over rice and gravy with choice of two sides, roll or corn bread and choice of Mama Bull’s Sippin Tea, Lemonade or Arnold Palmer. Be adventurous, have one baked and one fried! The best of both worlds. 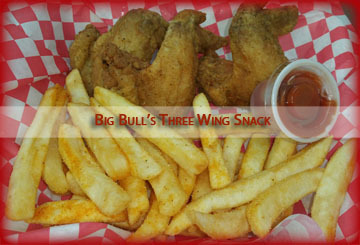 *You can add an additional turkey wing (baked or fried) for $3.99. If you love ribs, but hate fat, you will love baby backs. They are the leaner meatier rib. Smoked to perfection, Big Bull’s Way! Try a plate today! 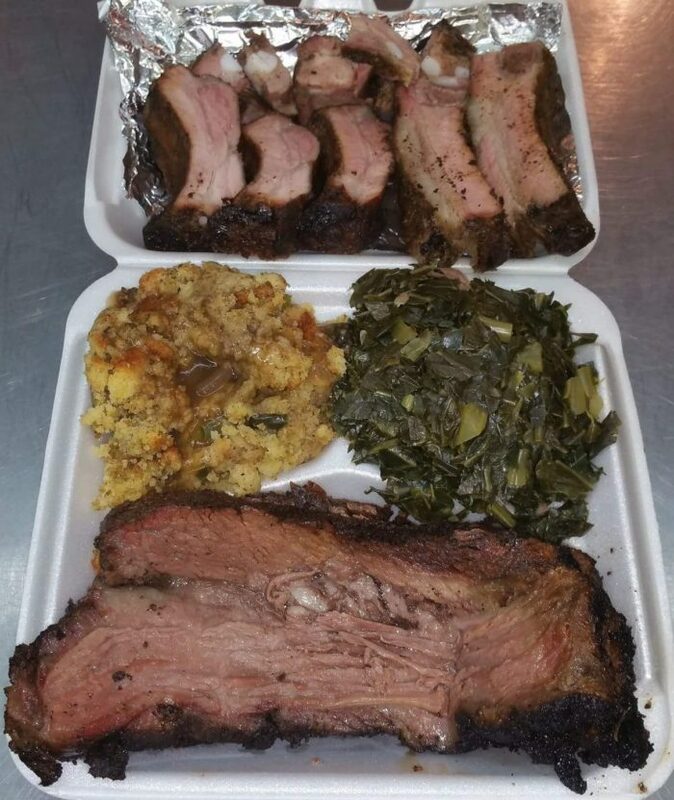 You get a half a slab (5 bones) of baby back ribs, your choice of two sides, Bull’s Signature Sauce and a roll or corn bread. Bull’s Famous Pulled Chicken is an alternative to pulled pork. It is full of flavor and can be eaten with or without our special sauces. Try it today with Sweet Golden Honey and 7 Seconds sauces. The pulled chicken over a bed of rice comes with the sauce of your choice, two sides and a roll/corn bread. The best Hash and Rice you will ever taste….in your life! 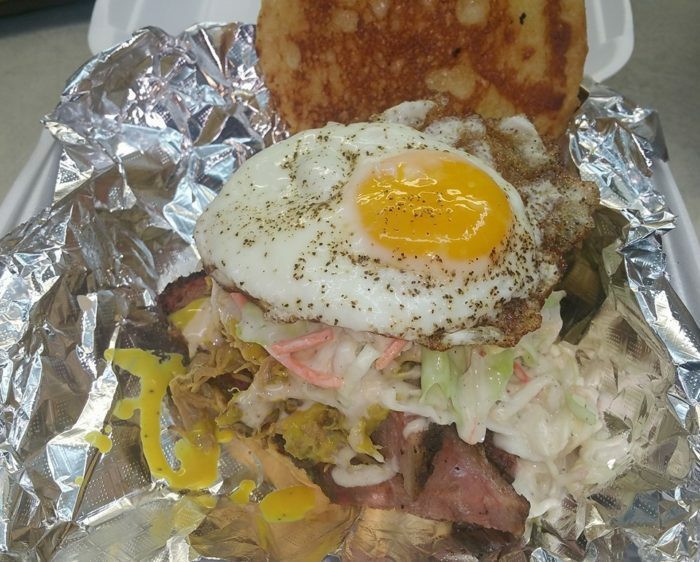 Bull’s Hash isn’t greasy or porky, because it is CHICKEN, you can literally eat it every day! 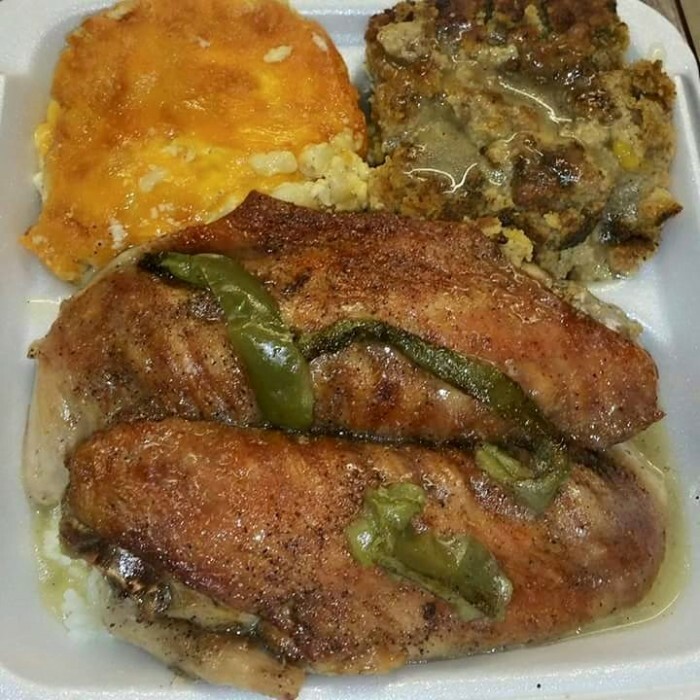 Our hash and rice plates come with two sides and a roll/corn bread. Choose from Bull’s 7 Signature Sauces to compliment your platter. 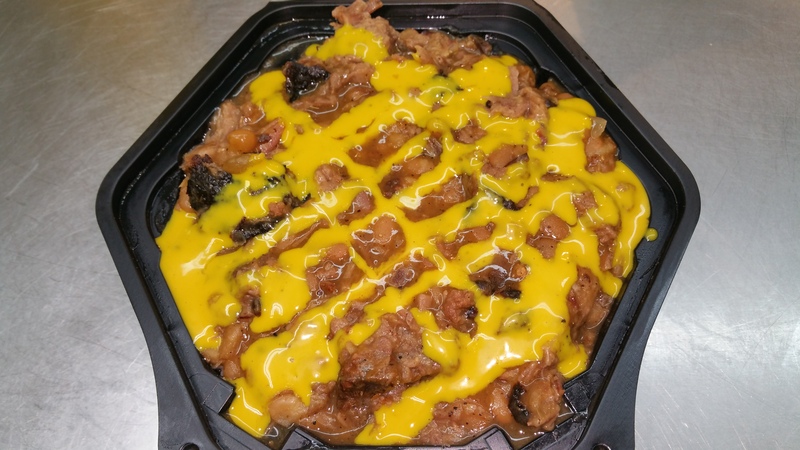 Don’t forget to try Bull’s Famous Pulled Chicken. Available with or without our signature sauces. Don’t forget to add one of our signature sauces! Shown with three of our Signature Sauces (Sweet Golden Honey, Bull’s White Sauce and 7 Seconds Sauce). 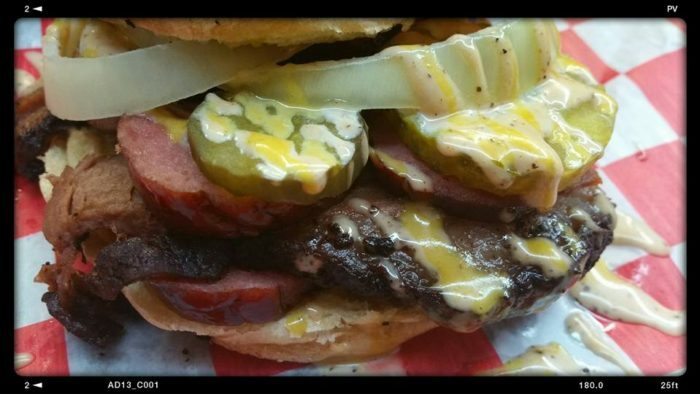 Bull’s famous smoked brisket, smoked Andouille sausage, onions and pickles covered in Bull’s White Sauce and an additional sauce of your choice, all on a buttery brioche toasted bun. Oh yeah, it’s as good as it sounds! 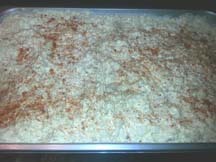 Have you tasted Mama Bull’s Famous Cheese Grits? You have been missing out! These are creamy, cheesy, deliciousness on a plate. 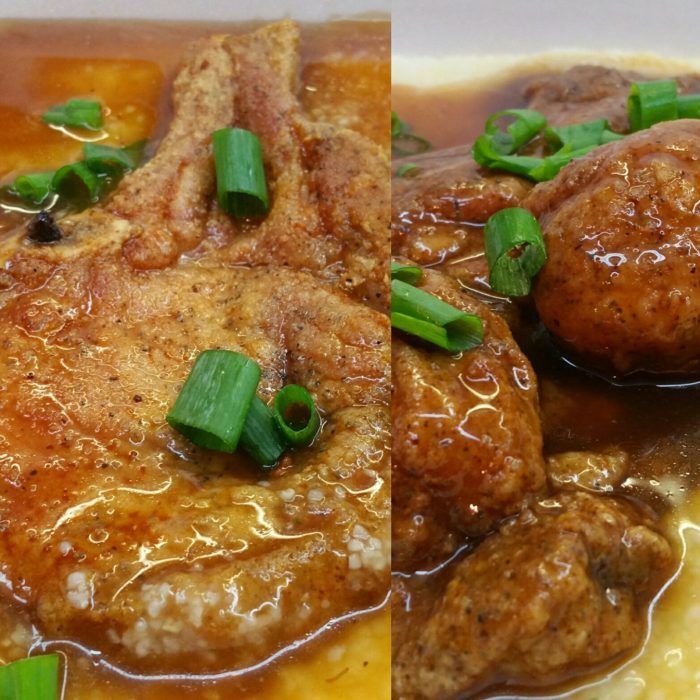 We cover them with our famous pork gravy and a fried or smothered pork chop. Yummy! Our cut wings come in increments of 5, 10 and 15. Add the signature sauce of your choice, from our 7 Bull’s Signature Sauces. Would you like fries with your wings? Add some for only $2.79! Finally, we are offering a Family Meal Deal! 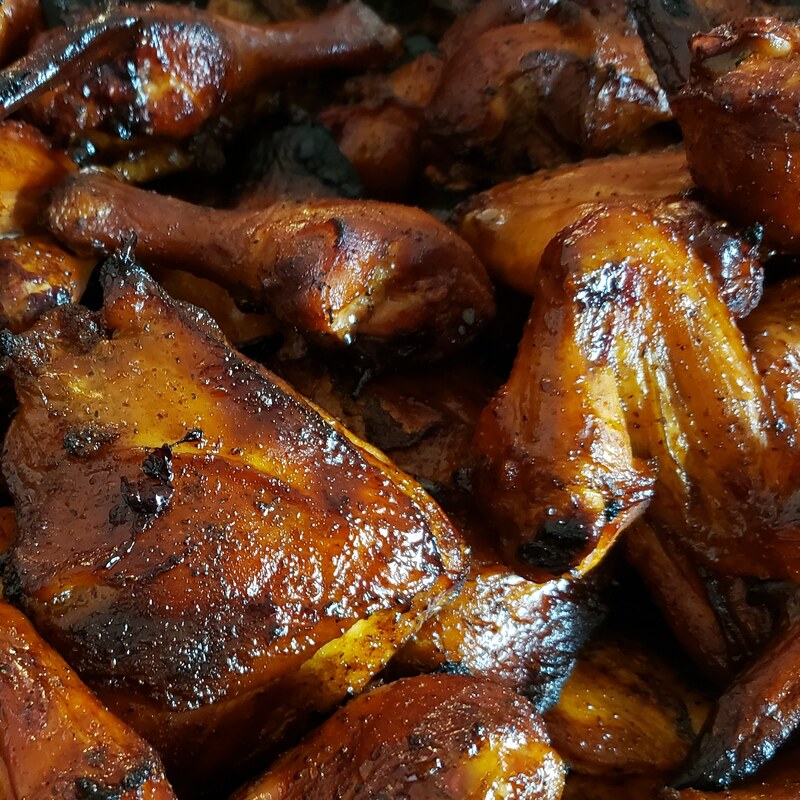 Enjoy, 12 pieces of low and slow smoked chicken with your choice of two large homemade sides, 4 pcs of homemade cornbread or rolls. Choose from our 7 Bull’s Signature Sauces to compliment your smoked chicken. 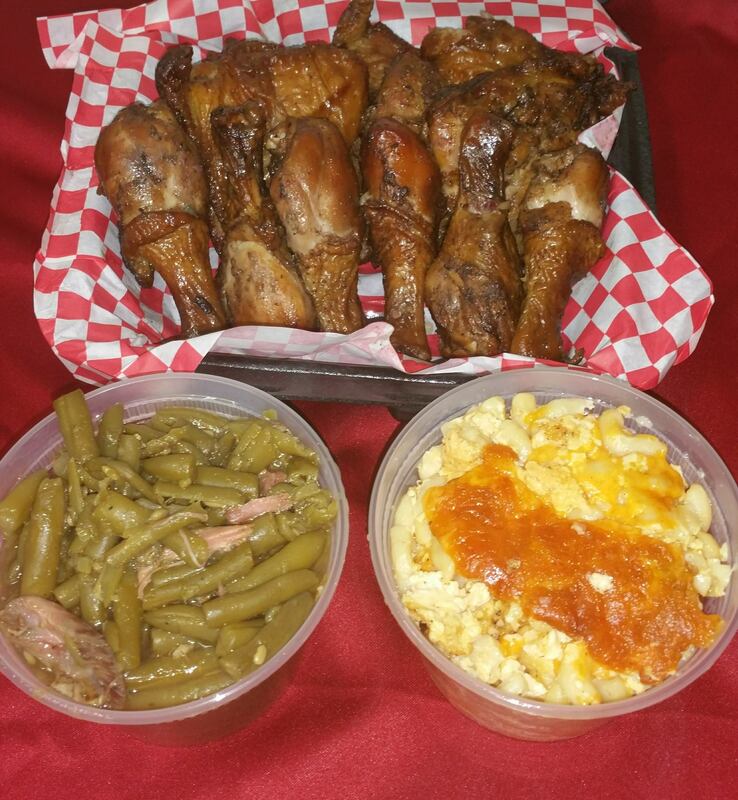 Enjoy, 8 pieces of low and slow smoked chicken with your choice of two large homemade sides, 4 pcs of homemade cornbread or rolls. Choose from Bull’s 7 Signature Sauces to compliment your smoked chicken. Have you tried THAT Dressing? Well, you are missing out. It defiantly isn’t just a holiday side anymore. Mama Bull has redefined holiday dressing and you can have it any day of the week! 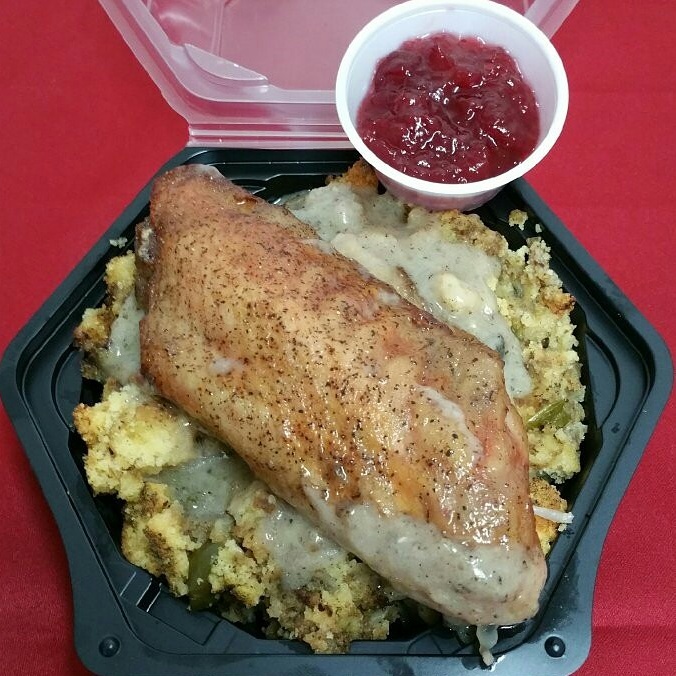 We top it with one of our baked turkey wings and gravy. Yummy! You may add a side of Cranberry sauce, for an additional $0.75. By the way, THAT Dressing is a meal all by itself! Try one of our new menu items. 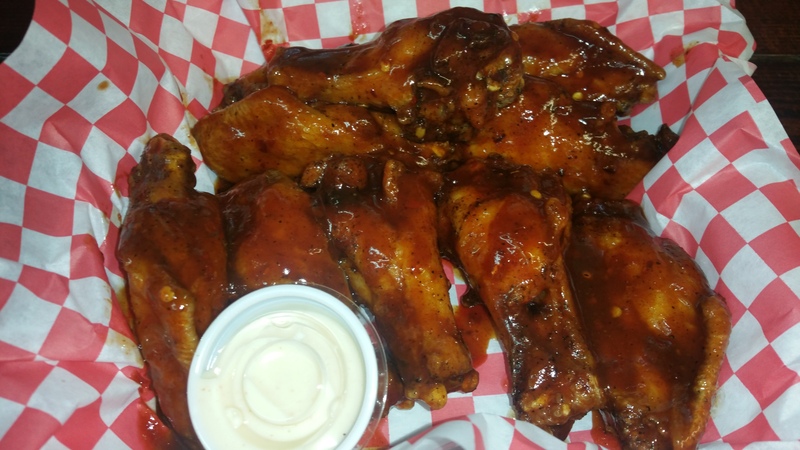 Big Bull’s now offers Sweet 7 Hot Wings. They have a hint of sweet and end with a BANG. Sweet 7’s are available in quantities of 5, 10 or 15. Because we know, some like it HOT, while ordering, ask for extra heat! Add some fries for an additional $2.79. 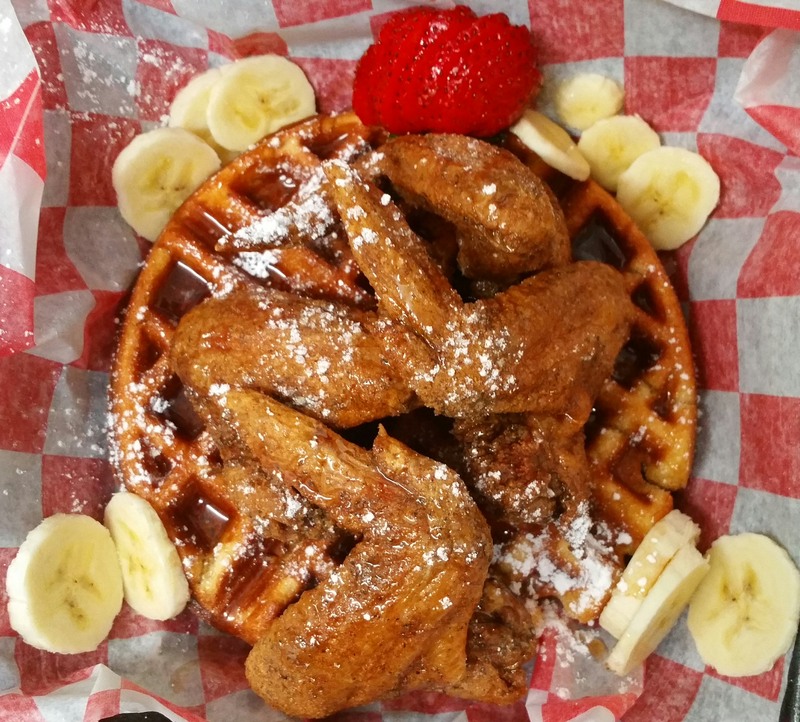 This isn’t your regular Chicken and Waffles. Our waffles are special (wink). Order one today and see why they are the talk of the town. Our waffles are almost like cake, instead of waffles! 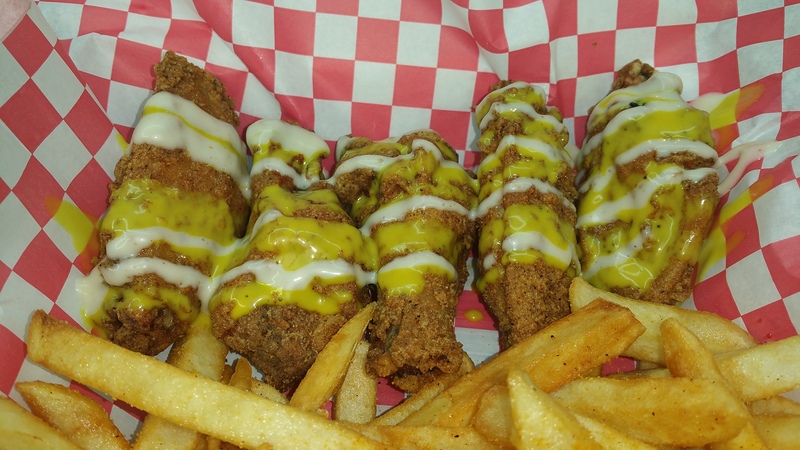 They are complimented with four crispy freshly fried chicken wings, a few slices of bananas and a strawberry, drizzled with syrup and powdered sugar. Add an additional wing for $2.99/each. 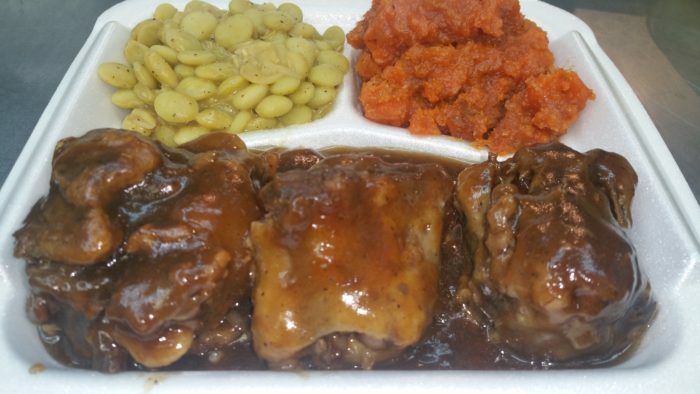 Tender Beef Oxtails over rice and gravy with your choice of two sides and roll/corn bread. A choice of Mama Bull’s Sippin Tea, Lemonade or Arnold Palmer. Do you like a little spice in your life? That’s what you will get with Bang, Bang Chicken! We have a special blend of spices to tickle your palate. Then we top it off with our signature Sweet Golden Honey and Bull’s White Sauces! Yummy!!! If you really want to be big and and bad, get the Bang, Bang, BANG Chicken! The third bang is from our 7 Seconds Sauce (starts sweet and ends spicy). Go big or go home! 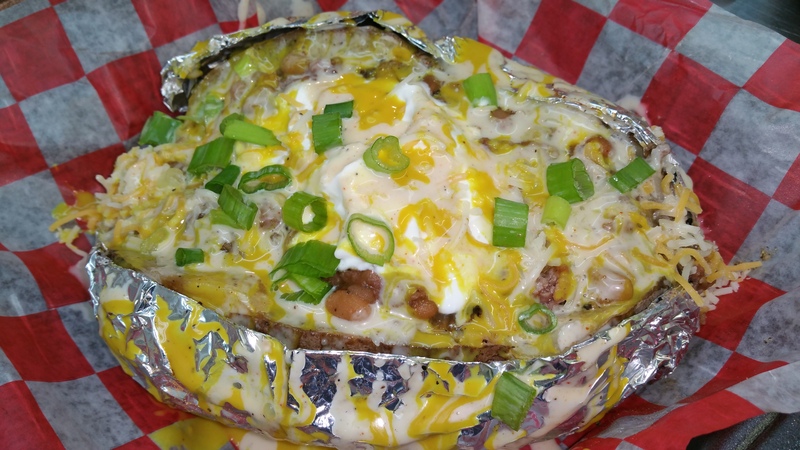 Try a hash and rice bowl today. It’s a great way to get your hash and rice fix. Big Bull’s hash is made from some of the leanest cuts of chicken. Therefore, you don’t have to concern yourself with a stomach full of grease or a headache, after you finish eating, The Best Hash and Rice in Town. Choose from Bull’s 7 Signature Sauces to compliment your bowl. If you love pulled pork and rice, you will love it in a bowl. Now, you can have pulled chicken, too. Try it today! Choose from Bull’s 7 Signature Sauces to compliment your bowl. 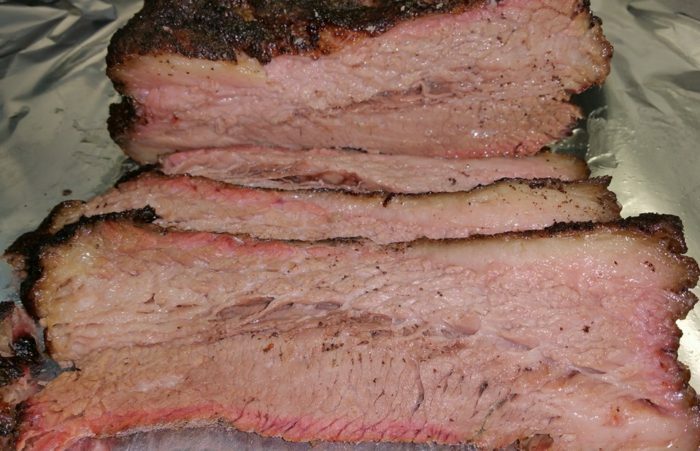 This is the BEST Smoked Brisket in Northeast Columbia. Nope, the best in South Carolina. Oops, I meant the BEST on the East Coast! Yes, that’s right! Big Bull’s doesn’t just serve pork! As a matter of fact, we don’t season our vegetables with pork. Order some of our pulled chicken by the pound, as an entree or as a sandwich! Be sure to complement your chicken with one of Big Bull’s signature sauces. We offer our pulled pork by the pound. 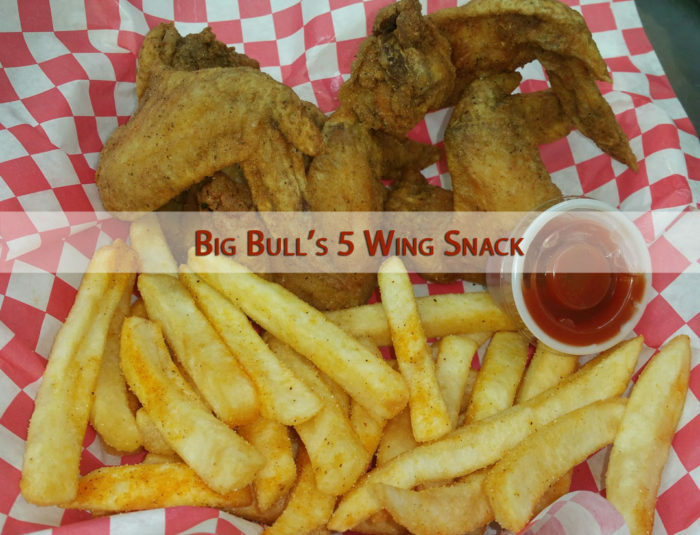 Add your choice of one of Bull’s signature sauce, there are six to choose from. Order some today for an evening in with friends, family or make a few sandwiches for yourself. 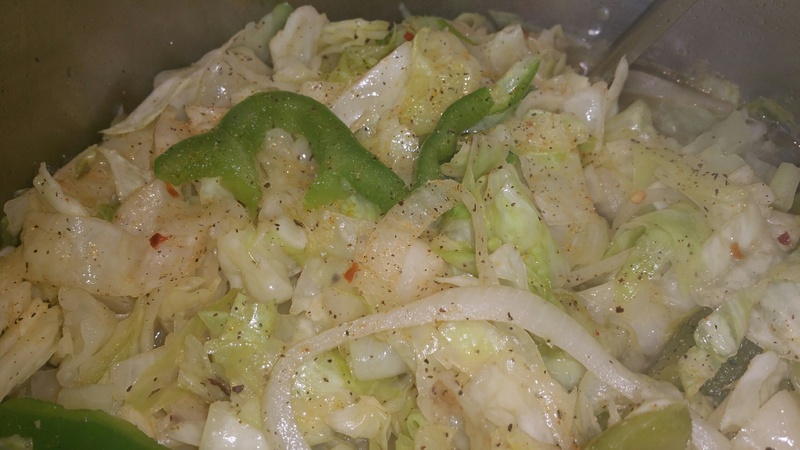 Be sure to add a side of cole slaw to complement your pound. Create a new memory, with the Big Bull’s! 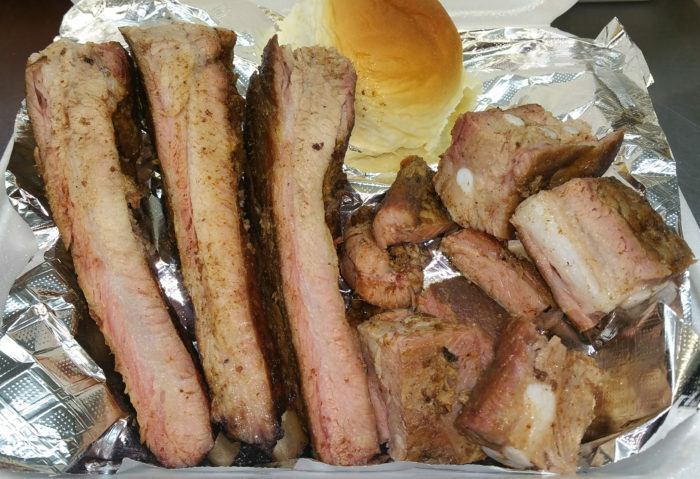 Pick up a slab of amazingly smoked ribs. St. Louis ribs are a perfectly blended marbled meat. The fat adds layers of flavor to every bit. Choose from Bull’s 7 Signature Sauces to compliment your smoked ribs. Try our a slab of baby back ribs. 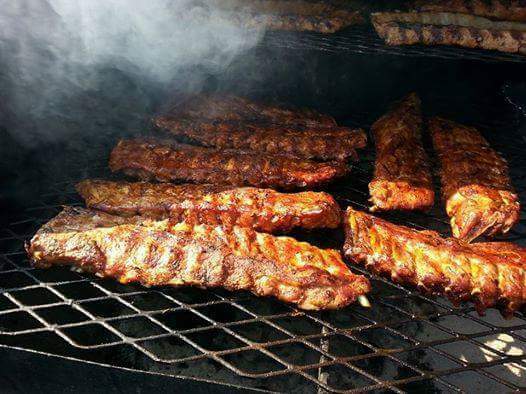 You get 10 pieces of lean premium pork ribs, smoked to perfection. Add one of our signature sauces for added flavor. 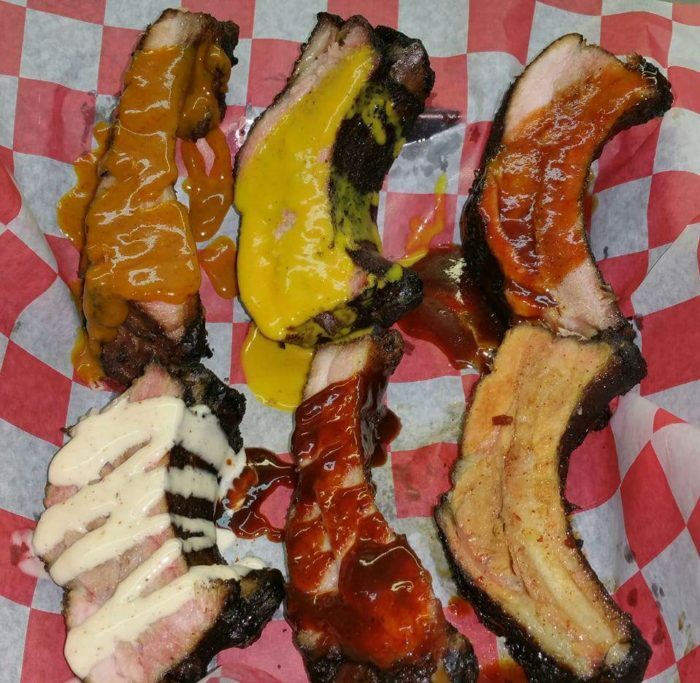 Choose from Bull’s 7 Signature Sauces to compliment your smoked ribs. Our Holiday Meal Deals are available here, click link! Our Entire catering menu is also available via the same link. This isn’t your mother’s Thanksgiving Dressing, it’s a meal in itself. Everyone loves cole slaw, right? This isn’t your traditional cole slaw…. Sandwiches with one sauce choice on all sandwiches or no sauce, a bag of chips and a can of soda or bottle of water. Guidelines: Order online for 25 people, a minimum of 5 hours notice. Order online for 26-50 people, a minimum of 24 hours notice. Order online for 50+ people, a minimum of 4 days notice. “Do you sell the crust only? I will purchase the crust for $20.00 a pound!” Yeah, it’s that good! Even if you don’t like key lime pie, you are going to love Mama Bull’s Key Lime Cake with cream cheese icing. Three layers of banana cake with banana cream icing. Three layers of heavenly red velvet cake with cream cheese icing. Click the link below, to download our catering menu. We do not create quotes, without an $89.00, non-refundable quote fee, in advance. Therefore, if you are just researching prices via various catering companies, we suggest downloading the menu and submitting your request for a final quote, once you decide your customized menu is within your budget and you are required to submit one for review. Otherwise, we suggest creating a tentative quote for review. This option is only required if you are only requesting a quote and aren’t sure on the final menu, price, budget, etc. Click the link below, to download our catering menu. 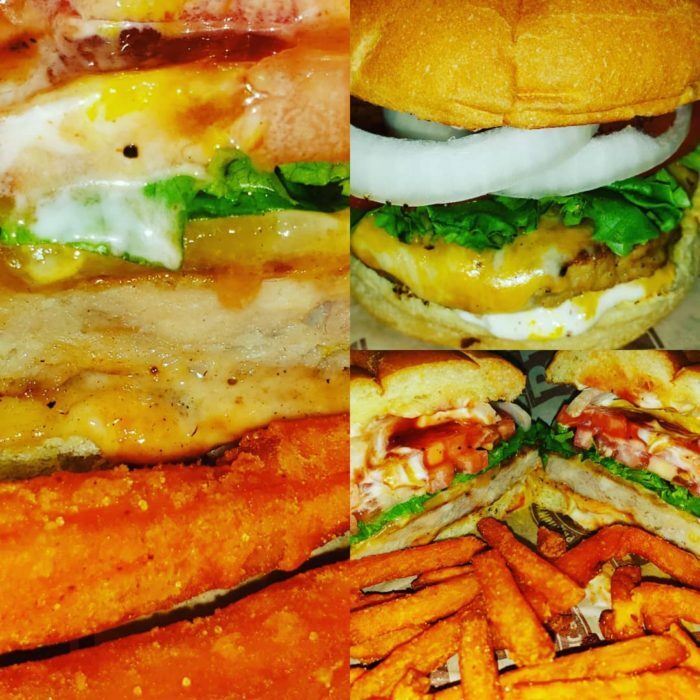 If you desire a quote, please forward the following information: Date, time and location of the event, your budget for the event, full service, pickup or delivery, entire menu, the number of persons to be served and additional supplies you are requesting. Go to the online menu and purchase a catering quote ($89.00), then forward the required information to catering@bigbullsbangnbbq.com. Not just your regular lemonade, this is Strawberry Lemonade. Made with real strawberries and lemons. Amazing blend of flavors, made with real lemons! Our Sippin Tea is a flavorful blend of fresh citrus fruits. 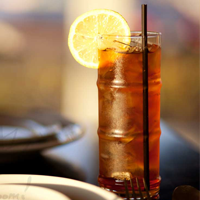 Every Thursday, each meal comes with a glass of freshly made Sippin Tea. Half gallon jugs are also available for purchase. Three layers of sweet, moist, homemade red velvet cake with an amazing vanilla cream cheese icing. 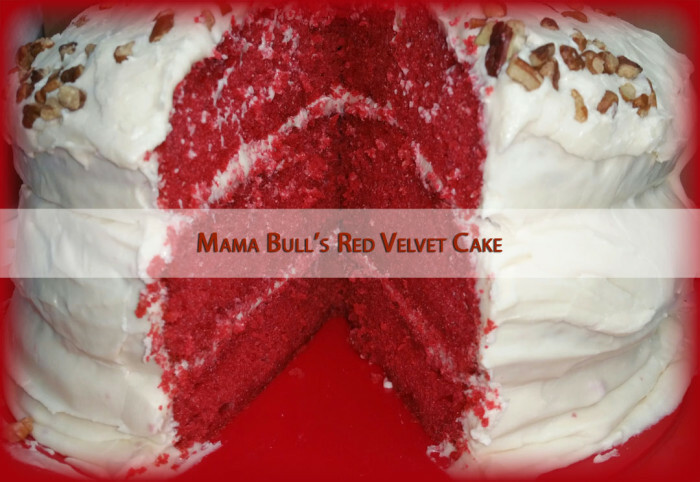 It’s Red Velvet Cake, made the way Mama Bull makes it! Create a new memory with Big Bull’s! 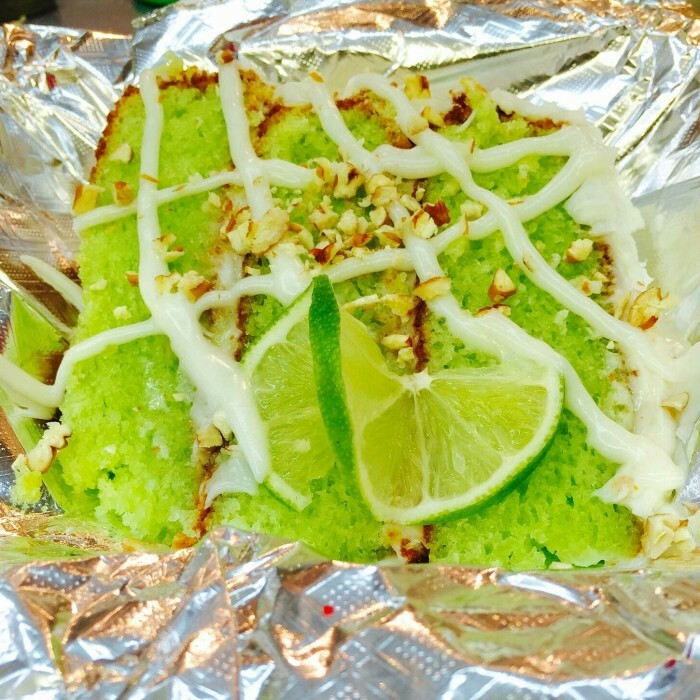 We have all heard of Key Lime Pie before, now taste Mama Bull’s Key Lime Cake! Three layers of homemade key lime cake, homemade icing with nuts. It is bursting with amazing favor! 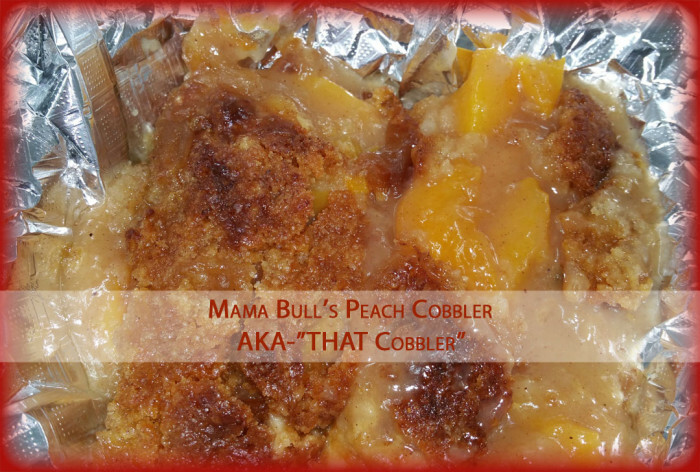 Have you ever had a “Perfect Peach Cobble”? Well, stop by Big Bulls and try it out! Absolutely the best banana pudding you have ever had in you entire life. 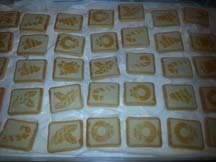 Topped with some of the best butter cookies you will ever taste! Try some today! 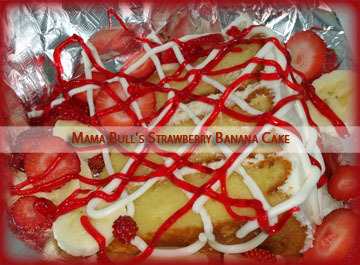 If you like bananas or strawberries, you will love this cake! From the fresh strawberries and bananas, to the banana cream cheese icing! Yummy! 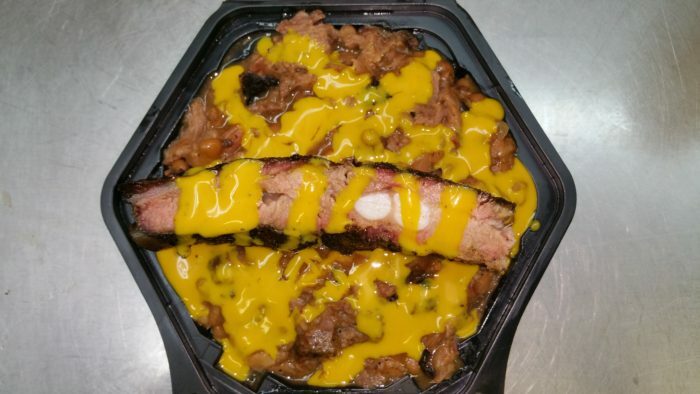 Let’s add some of Big Bull’s Famous Brisket to a spud, with some of Mama Bull’s Baked Beans, with a smoked sausage…It’s an explosion of flavors at one time. Don’t miss your chance to say I had a party in my mouth, a real party! Includes cheese, sour cream, chives, Bull’s White Sauce and your choice of an additional Bull’s Signature Sauce for a little fireworks! Smoked Beef Brisket and Smoked Pulled Pork on a Loaded Spud! We top it off with cheese, sour cream, chives, your choice of sauce and Bull’s White Sauce. Let’s add some of Big Bull’s Famous Brisket to a spud, with some of Mama Bull’s Baked Beans…It’s an explosion of flavors at one time. Don’t miss your chance to say I had a party in my mouth, a real party! 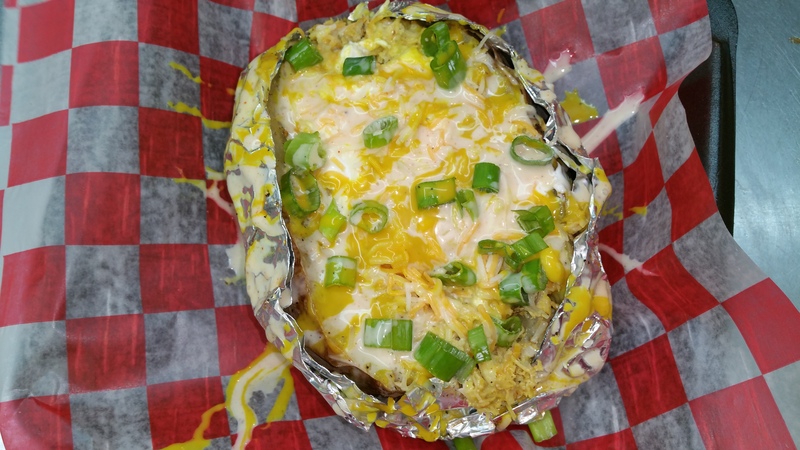 Includes cheese, sour cream, chives, Bull’s White Sauce and your choice of an additional Bull’s Signature Sauce for a little fireworks! Desire a burger, but not the red meat? Well, we have a treat for your…order Mama Bull’s Double Chicken Burger! Our chicken burger comes on a toasted bun with mayo, mustard, ketchup, lettuce, tomato and onions. Don’t forget to add wing chips or fries to your order. Desire a burger, but not the red meat? Well, we have a treat for your…order Mama Bull’s Chicken Burger! Our chicken burger comes on a toasted bun with mayo, mustard, ketchup, lettuce, tomato and onions. Don’t forget to add wing chips or fries to your order. Try our Pulled Chicken Sandwich today! 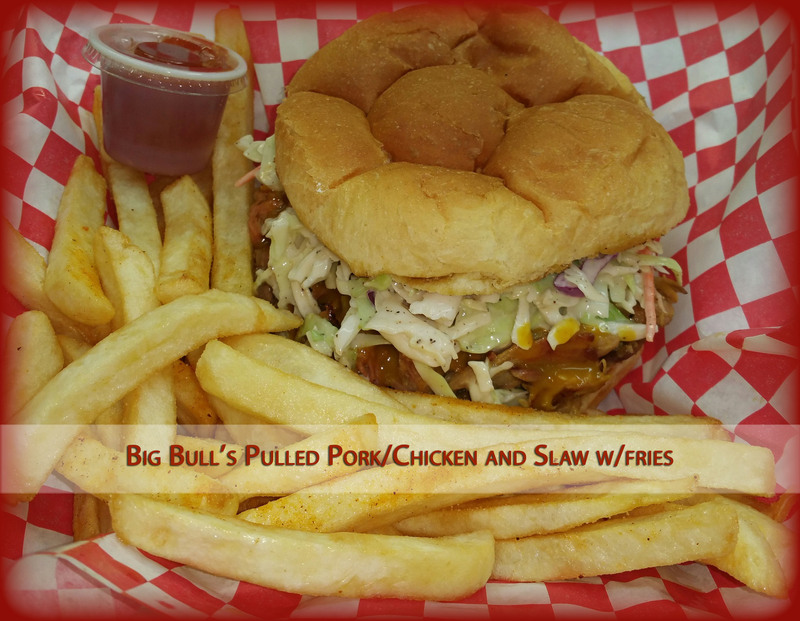 Pulled Chicken comes on a buttery toasted bun, your choice of Bull’s signature sauce infused into your chicken. Add our seasoned fries for a real treat. A great alternative to pork. Who doesn’t love Pork Chops? 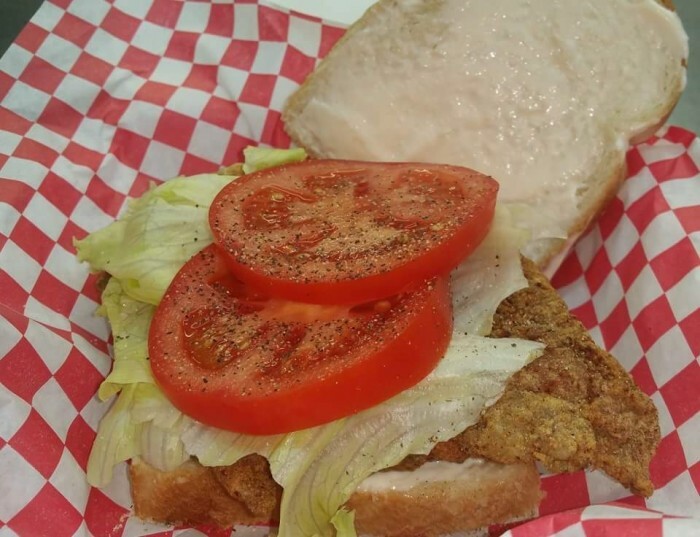 You would really love Bull’s Fried Pork Chop Sandwich. A seasoned piece of fried pork chop, lettuce, tomato and mayo on two slices of bread with fries. 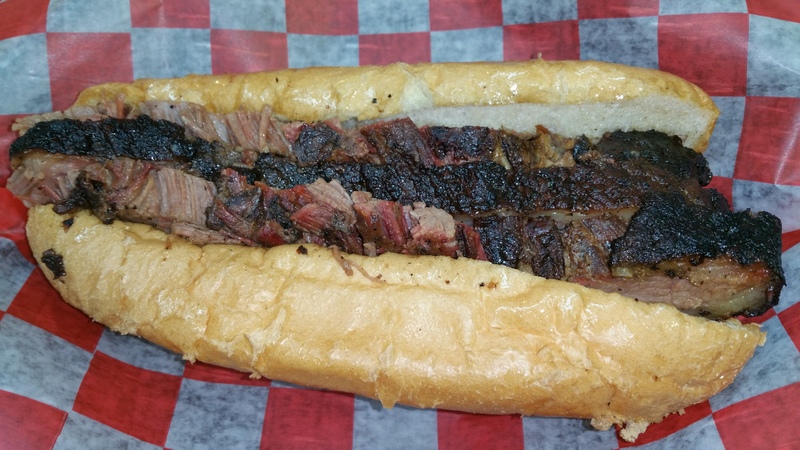 Big Bull’s Bang’n BBQ and Southern Comfort Food isn’t just a place to stop in and get some amazing Bar-B-Que, we have some of the best sandwiches around! Stop by today and try a Bull’s Double Burger. 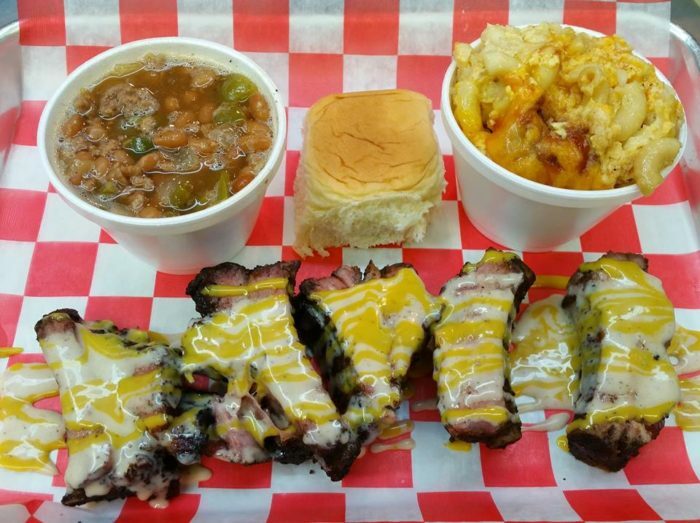 Big Bull’s Bang’n BBQ and Southern Comfort Food isn’t just a place to stop in and get some amazing Bar-B-Que, we have some of the best sandwiches around! 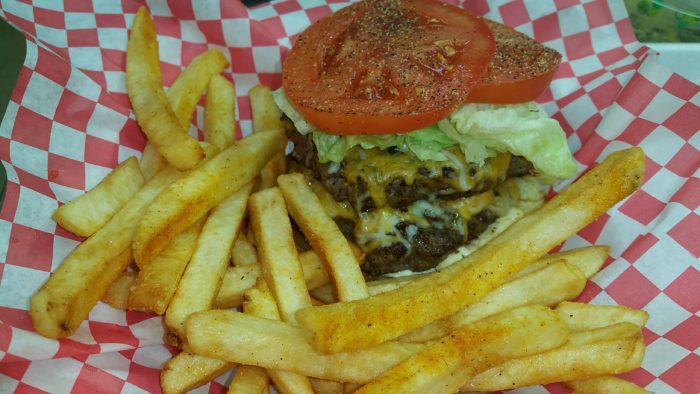 Stop by today and try a Bull’s Burger. If you LOVE meat, make it a Double Bull’s Burger (picture shown)! Have you tried THAT Dressing? Well, you are missing out. It defiantly isn’t just a holiday side anymore. Mama Bull has redefined holiday dressing and you can have it any day of the week! There are no words to explain the deliciousness of this creamy, cheesy item. So, we won’t waste your time reading it. Just take a moment to savor the flavor. Like everything else on our menu, we offer a lighter non-pork option to one of everyone’s favorite southern comfort item. Fear not, it still taste good! In the south, your meal must include rice! Add rice and gravy to any meal! Available as a pork or non-pork (turkey or beef) item. 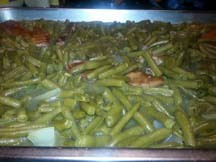 Our lima beans are another non-pork item. You will enjoy a lighter side item to compliment your meal or create a vegetable plate. 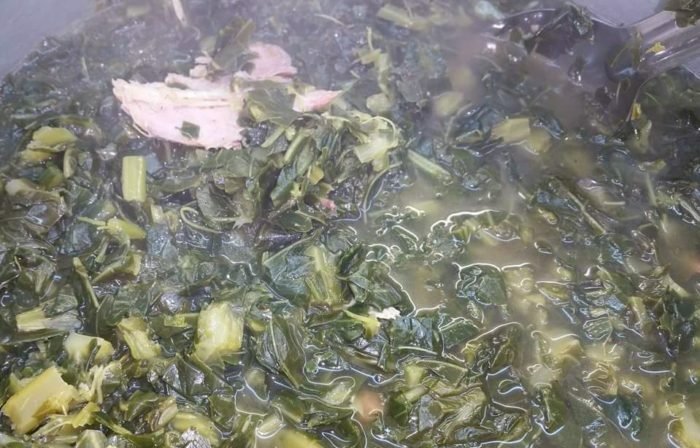 Finally, Mama Bull has added cabbage to the menu! Like all of our sides (except Baked Beans and That Dressing), this is a non-pork item. It’s light, fresh and full of flavor. Traditional? Yes and no! Its will take you back to grandma’s house, in a flash. Can you taste it yet? Yummy! Mama Bull’s Famous Baked Beans will leave you wanting more! Meat in baked beans? You must try these! She really bakes her baked beans!!! They are like a meal, all by itself. Love chicken wings, but would like a side instead of fries? Now, you can choose from our famous sides, to compliment your wings. Crispy fried chicken wings with seasoned fries? Of course, we have those!